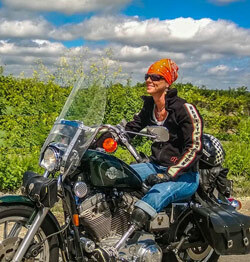 We all know that the passion for riding a motorcycle brings with it certain inherent dangers. As motorcyclists many of us take riding classes, practice our emergency maneuvers, keep our eyes peeled and constantly scanning, but sometimes – sometimes – it’s not enough. Sometimes circumstances, happen-chance, and other people’s choices leave us scarred for life, in the worst of cases, take a life. I have always been aware of the dangers both small and large that accompany driving a motorcycle, but it was not until somebody changed my life that I fully began to understand so very many new things. For those that are not aware, here is my short story. After losing a corporate job in 2012 and having little luck of finding another with reasonable salary, I made the insane and overwhelming awesome decision to be homeless. Well, at least that’s how I used to tell it. I sold nearly everything I owned, I ramped up my Virtual Assistant business, The Write Hand; I loaded my dog, laptop, and peripherals onto my 1995 Harley Davidson Sportster 883. I left Illinois in February 2013 to tour the United States and grow my business. The months I spent traveling on my motorcycle, sleeping in the woods or abandon buildings, and meeting folks from all walks of life along my path, were some of the most freeing days in my entire life. Never for a single second do I regret what I did, not even as I laid in that ditch. As I headed into a deep left curve a semi-truck approached in his lane. As always, I gently moved right a little, always giving a bit more room for a semi in case they fudge slightly. And there it was, barreling at me at a speed I learned was well over the limit – a young man in a car was trying to pass the semi-truck and was headed straight at me in MY LANE – MY FREAKIN LANE!! I was traveling about 55 mph and the other vehicle between 70 and 80. Every time I take my memory back to that place, one thing permeates my brain – the young man and I screamed simultaneously, “No, No, No!” He did a great deal to help and aid as I lay in that ditch and for the next half hour the end of my life was more than apparent to me and to the support personnel buzzing all around the scene. With my insides on the outside, we all knew that I was going to die and that was that. I thanked God for all that he had given me, thanked Him for letting me accomplish my dream, and asked Him to take care of my son and granddaughter. With a great deal of vigor in that half hour or so, I was eventually loaded into a helicopter bound for Regions Hospital in St. Paul. A lifetime ago, the last thing I saw was a helicopter door open and blue skies and sunshine spilling onto my face, and then I died. Yippee for amazing surgeons and modern technology because I was not intended to stay dead. I could go on about the number of hours and surgeries, the blood content of my body being replaced three times over, all the drugs, the pain, the nightmares, the rage, the pity, and the Why Me questions. Motorcycle riders are particularly at risk for losing legs in a crash involving another vehicle. If you think about it logically, our entire body is exposed and if another vehicle comes in contact with us it is most likely going to strike somewhere in the leg area. A vehicular crash is only one simple way to become an amputee. There are medical issues like cancer and diabetes that take limbs quite often. Work related accidents and even birth defects leave folks missing part or all of a limb or limbs. Being a motorcyclist is not very unique these days; it seems there are motorcycles everywhere now. And being an amputee isn’t rare either. But how many amputee motorcyclists have you seen? Perhaps more than you even realize. Whether born amp’d or made amp’d, as long as your heart still beats, there is a chance at living a dream, loving a passion, and doing more than you ever thought possible. I can tell you one cliché that has and always will ‘set me off’; it’s when somebody says, “You can do everything you used to do and more.” Is it possible? Yes. Is it likely? That can be questionable. Average folks see Olympic athletes and TV show stars with amputations doing amazing things and they assume that ALL amputees can do these things. That is NOT so. Riddle you this Batman… Prosthetics cost a lot of money and the more ‘tricked out’ they are, the more they cost. Even with health insurance it can be exorbitant to pay our out of pocket portion for such a piece of durable medical equipment. This doesn’t even take into consideration other health issues that may need attention. And do not be a fool to think that if somebody else causes an injury that their insurance will suddenly make all the problems go away. In most cases, folks don’t have enough coverage on their auto policy to come close to paying for lost wages for months or years, hundreds of thousands in medical bills, and costs associated with future care. This is putting it lightly because there are only so many pages in this magazine. There is no place for backward thinking when there is so much more that is bigger and better waiting for us ahead. Just 18 months ago this horrific experience changed my life FOREVER. In the time that has passed since, I have learned a great deal about being an amputee, about my own inner strength, and about the plight that others have faced before me. I have talked to others with physical impairments and have helped them choose amputation over unending surgeries and pain. I have shared with whoever will listen and I have listened to whoever will share. I have found a greater respect for myself and for so many others that I didn’t really “see” before. Most of us realize that until a certain thing affects you personally, you cannot fully comprehend the entire breadth of a situation. And so I welcome 2015 in its enormity and potential, with the support of my family, my friends, and my social media followers that all helped me rise up and not start over, but rather START NEW! This article is a brief look at my personal tragedy and loss of limb which I share openly. The PTSD, nightmares, and struggles continue but get weaker as I grow stronger. My physical abilities improve a bit more with most days and I am functioning in a somewhat regular lifestyle. There remain a great many challenges and things that have been altered terrifically which I am still attempting to understand and overcome. So many folks don’t understand the daily functionality of an amputee, they may not understand how mentally taxing such an experience can be, and they likely do not understand why on earth somebody like me would ever think of getting back on a motorcycle. 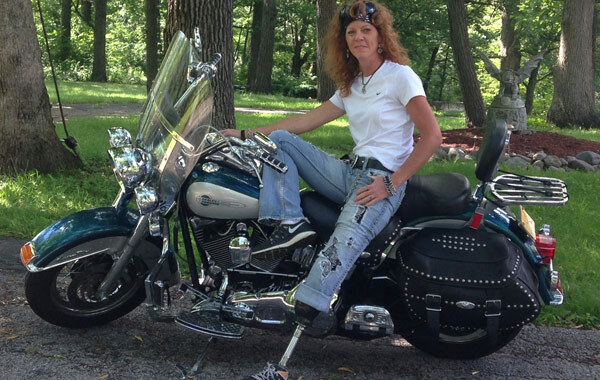 This article serves as a lead-in story for a project I have taken on to raise awareness of what amputee life is like, the trials, and the triumphs ~ most particularly, I am focusing on Amp’d Motorcyclists. I will be interviewing verbally many amputees that have lost limbs and gone on to continue their passion for motorcycle riding. We will hear all about their personal amputation, the modifications to bikes, the things that challenged them when they began riding again, and much more. The project will be followed with an article of summary from these great stories. If you are or know an amputee motorcyclist, please reach me to participate in this project.